Explore the monolithic serenity of the sacred Red Centre. Indulge in food and relaxation while you cruise through beautiful South East Asia aboard the Pacific Dawn. Admire the colourful surroundings of Singapore as you spend a few nights exploring it’s traditional and new age charm. 5 day Alice Springs, Uluru & Kings Canyon Adventure tour including Uluru Sunset BBQ Dinner. Transfer from your hotel to the Alice Springs Airport. 2 night stay in Darwin at Doubletree by Hilton Hotel Esplanade Darwin including breakfast. 24 hour Darwin Hop on Hop Off City Explorer pass. 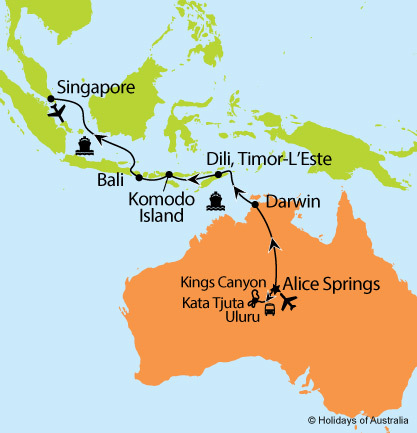 8 nights aboard Pacific Dawn crusing from Darwin to Singapore with port calls to Dili (Timor L-Este), Komodo Island (Indonesia) & Bali (Indonesia). Includes on board meals and entertainment. One way flight from Singapore to your closest capital city.